When I decided I wanted to make a Pumpkin Muffin that has a lot of nutritional value yet still tastes great, I knew exactly where to look. It was a cookbook by Canadian Anne Lindsay called Smart Cooking - Quick and Tasty Recipes for Healthy Living. This Pumpkin Muffins does not disappoint. They are actually what I would call a Pumpkin 'Bran' Muffin as they contain unprocessed wheat bran. Besides the bran they contain whole wheat flour, pumpkin puree, raisins, buttermilk (or yogurt), and oil instead of butter (which contains more saturated fat). Each Pumpkin Muffin has about 200 calories and is a good source of fiber and Vitamin A. So let's talk a little about the ingredients used in these delicious Pumpkin Muffins. One way to start making our baked goods more healthy is to try replacing at least some of the all purpose white flour in a recipe with whole wheat flour. Whole wheat flour is milled from the entire whole wheat berry, so it still contains its bran (fiber) and its germ (rich in oil, protein, iron and vitamins). This makes it rich in fiber and it also has a nutty toasted flavor which is excellent in these muffins. The other ingredient you may not know much about, and yet it is very good for us, is unprocessed wheat bran. (Wheat bran can be found in most grocery stores on the baking isle or in the health food section, and it can also be found in health food stores.) Wheat Bran is the outer layer (shell) of the wheat kernel and even when ground it is not considered a flour but a fiber. It is high in carbohydrates, calcium and fiber and it adds a mild earthy taste and coarse flaky texture to these Pumpkin Muffins. Buttermilk is also used in these muffins. Buttermilk (or you can use plain low fat yogurt) has a nice thick creamy texture with a rich tangy buttery taste that makes baked goods tender and moist. Whereas in the past buttermilk was made from the liquid left over after churning butter, it is now commercially made by adding a bacteria to whole, skim, or low fat milk. You can make your own buttermilk by adding 1/2 tablespoon of white distilled vinegar, cider vinegar, or lemon juice to 1/2 cup (120 ml) of milk. Just let this mixture stand 5 to 10 minutes before using. Or you can buy buttermilk powder which can be found in some grocery stores or in specialty food stores. Pumpkin Muffins: Preheat oven to 400 degrees F (205 degrees C). Place rack in the middle of the oven. 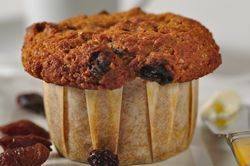 Line 12 muffin cups with paper liners or spray with a non stick vegetable spray. In a medium sized bowl mix together the pumpkin puree, eggs, buttermilk, and oil. Set aside. In a large mixing bowl, combine the flour, bran, sugar, baking powder, baking soda, cinnamon, and salt. Add the milk and egg mixture to the flour mixture. Stir until just combined. Fold in the raisins. Do not over mix the batter or the muffins will be tough when baked. Fill the muffin cups with the batter using two spoons or an ice cream scoop. Place in the oven and bake for about 18 - 20 minutes , or until firm to the touch and a toothpick inserted in the center comes out clean. Place on a wire rack to cool. Lindsay, Anne. 'Smart Cooking'. MacMillan of Canada. Toronto: 1986.